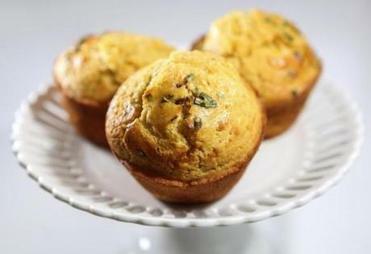 The savory quick breads known as cakes sales are fixtures of French home cooking. Olives and rosemary flavor this simple bread. The savory quick breads known as cakes sales are fixtures of French home cooking. Often served with wine and aperitifs, they also appear at picnics, potlucks, and other informal meals. With the rack in the middle position, heat the oven to 350 degrees. Spray a 9-by-5-inch loaf pan with nonstick baking spray, sprinkle bottom with ¼ cup of the coarsely grated Parmesan, and set aside. In a large bowl, whisk the flour, baking powder, 1¼ teaspoons salt, and ¾ teaspoon pepper to combine. Add the olives and toss with the dry ingredients. In a medium nonreactive bowl, vigorously whisk the eggs, yogurt, oil, rosemary, and the ½ cup finely grated Parmesan. Add the dry ingredients and stir just until incorporated and smooth (do not overmix). Scrape the batter into the loaf pan, smooth, sprinkle with the remaining coarsely grated Parmesan, and bake until golden brown and a toothpick inserted near the center comes out clean, about 45 minutes, rotating the pan halfway through. Transfer the pan to a wire rack and cool for 20 minutes. Remove loaf from pan, cool to room temperature, and serve. At the Somerville bakery, a delicious savory treat. 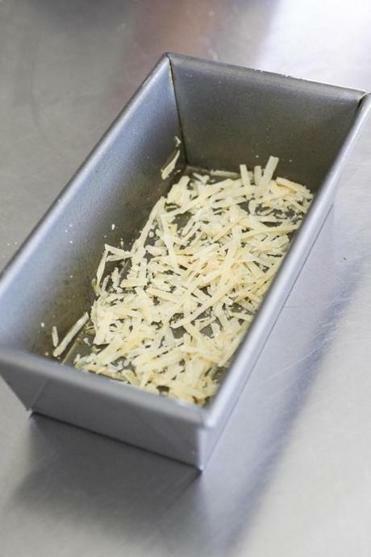 1) Substitute coarsely and finely grated gruyere for the Parmesan. 2) Cut 4 ounces baked ham into 3/8-inch cubes, then brown in 1 tablespoon olive oil for about 3 minutes and set aside. 3) Cut an additional 4 ounces gruyere into 3/8-inch cubes. Substitute the browned ham and gruyere cubes for the olives and 1 cup chopped fresh parsley for the rosemary. If you can’t find dried pears, use dried apples instead. They’re great, too. 1) Omit the coarsely grated Parmesan. 2) In a medium bowl, cover ½ cup finely chopped dried pears (about 1½ ounces) with hot water and set aside to soften, about 15 minutes. Drain and dry with paper towels. 3) Substitute the hydrated pears and ¾ cup crumbled blue cheese (about 3½ ounces) for the olives. 4) Substitute fresh thyme for the rosemary. With the rack in the middle position, heat the oven to 350 degrees. Remove the outer papery skins from the garlic and cut off the top quarter of each head. Set the heads on a sheet of foil, drizzle each with 1½ teaspoons oil, and wrap in the foil. Roast until the garlic is very tender, 45 to 60 minutes. When cool, squeeze the garlic cloves from the skins and mash the pulp with a fork; set aside. Meanwhile, cut the chorizo into 3/8-inch cubes (about ¾ cup). In a medium skillet over medium heat, heat the remaining 1/3 cup oil. Add the chorizo and cook, stirring, until browned and the oil is tinted red, about 2 minutes. With a slotted spoon, transfer chorizo to a paper towel-lined plate to drain; set oil aside to cool. 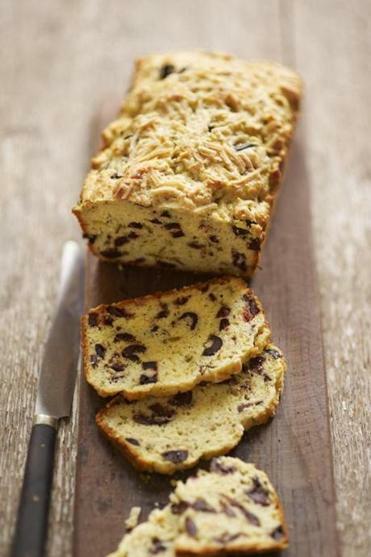 Spray a 9-by-5-inch loaf pan with nonstick baking spray and set aside. In a large bowl, whisk the flour, baking powder, 1¼ teaspoons salt, and ¾ teaspoon pepper to combine. Add the chorizo cubes and toss. In a medium nonreactive bowl, vigorously whisk the cooled oil, eggs, yogurt, Parmesan, and mashed garlic. Add the flour mixture and stir just until incorporated and smooth (do not overmix). Scrape the batter into the loaf pan, smooth, and bake until golden brown and a toothpick inserted near the center comes out clean, about 45 minutes, rotating the pan halfway through. Transfer the pan to a wire rack and cool for 20 minutes. Remove loaf from pan, cool to room temperature, and serve. Set the oven rack in the middle position and heat the oven to 350 degrees. Spray a 9-by-5-inch loaf pan with nonstick baking spray. Cut carrots into 3/8-inch-thick coins. In a large skillet over medium-high heat, heat 1 tablespoon oil until shimmering. Add the carrots and cook, stirring once or twice, until lightly browned, about 6 minutes. Add broth, cover, adjust heat to medium-low, and cook until carrots are tender, about 3 minutes. Uncover, add shallots, adjust heat to medium-high, and cook, stirring, until liquid is evaporated. Off heat, set aside to cool. Add half the cooled carrots to a food processor and puree (you should have 1 scant cup); reserve carrot puree and coins. In a large bowl, whisk the flour, baking powder, 1¼ teaspoons salt, and ¾ teaspoon pepper to combine. Add the reserved carrot coins and the walnuts and toss. In a medium nonreactive bowl, vigorously whisk the remaining 1/3 cup oil, eggs, yogurt, and Parmesan. Mix the carrot puree into the egg mixture. Add the flour mixture and stir just until incorporated and smooth (do not overmix). Scrape the batter into the loaf pan, smooth, and bake until golden brown and a toothpick inserted near the center comes out clean, about 45 minutes, rotating the pan halfway through. Transfer the pan to a wire rack and cool for 20 minutes. Remove loaf from pan, cool to room temperature, and serve.